There’s a growing awareness on the importance of having our kids play outdoors nowadays. Recent studies show that children, especially those aged 3 and below, who play outdoors regularly, grow up happier, healthier, and stronger! Is your kid too attached to his electronic gadgets? Have him to go out, mingle with other kids, and play! My little boy is having the time of his life now playing with his cousins. For as long as he is safe, I allow him to get dirty and play around! There’s an exciting news for all of you, moms. Outbox Media Production Agency once again invites you to the grandest family event of the year! Mark your calendar, it’s on April 14, 2013, from 10am-7pm and it’s happening at the Trinoma Activity Center! Let’s expect fun and learning talks on health, parenting and education from experts, parents and teachers, Early Head Start demos, exhibits, booths and fun activities! Let your child’s imagination run free with mind-boggling experiments and fun activities! 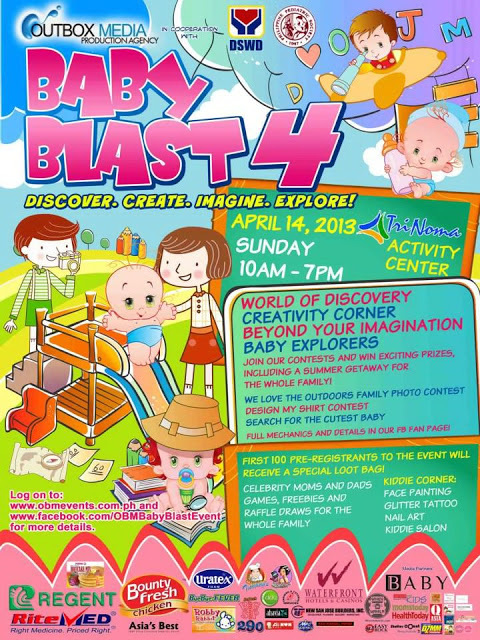 For kids age 5-12 years old: interpret this year’s event theme through a T-shirt design artwork: Baby Blast 4: Discover. Create. Imagine. Explore! Open to babies age 3 and below, who will attend the event on April 14, 2013. Winners will be announced during the program, and will get a chance to be featured in a baby magazine, plus take home special gift packs! The first 100 pre-registrants will receive a special LOOT BAG! Go ahead and LIKE OBM Baby Blast Event on Facebook for more information about this awesome event. You may also log on to www.outboxmedia.com.ph! See you and your kiddos! Admission is FREE! « A Call for Games for Kids by Kids + Giveaway!